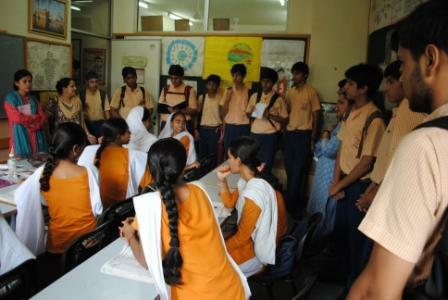 As a component of the work experience class, 240 students of Class IX of Sanskrit School, New Delhi were taken on a Community exposure visit to different ethnic communities in Delhi, on 4th and 5th august 2010. They visited Majnu ka Tila- a Tibetan refugee community, Kusumpur Pahari (a slum cluster in south Delhi), Jama Masjid area of Old Delhi and Nizammudin Basti. The Community Exposure provides an opportunity for the students to be exposed first hand to issues that concern and worry them within the urban space. The students get to interact with other communities and get information on health, education, livelihood, governance, women and child rights issues of the community. Through the day long interaction , the students interacted with the communities getting their perspective on the problems they face. 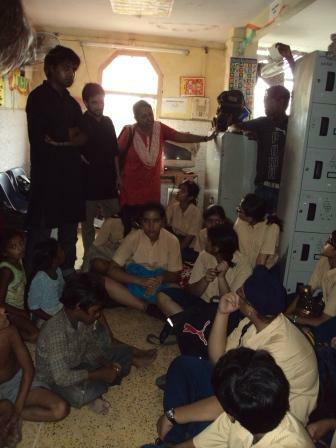 The students interacted with children from the community schools in the first half. They were curious to learn about the history of the place, community and people. They sang their school songs and played games with them and Sanskriti as well as the community school students presented songs for each other. They also asked each other about the subjects taught in their class, cultural and co-curricular programs of their respective schools. After an hour of interaction in the community schools, the students of Sanskriti School were than taken for their next level of interaction with the community people. The classes had been divided into smaller groups and each group was given a topic to gather information on, which would be later converted into individual projects for their work experience class. The topics given were to Culture & Community, Livelihood, Governance and Civic amenities, Women and Children, Education, Health and Sanitation. The students were taken to local market areas, homes and were interacted with as many local people as possible to find out details on their topic of survey. The idea was to understand the community through direct interaction with the community. Through this community visit the students got an opportunity to learn about cultural diversities, walk around places where they have never been before, learn about different people and most of all have an experiential learning firsthand from the local people in the communities about their culture, traditions, issues and struggles.